Thunder Levin is now a legend. The writer and director of dozens of movies, he finally achieved cult status when he wrote Sharknado. Now with Sharknado 2: The Second One coming to Syfy on July 30, we decided to ask him some hard scientific and philosophical questions about his series. Many of these questions were submitted by scientists and goofballs on Twitter (thanks! ), but as always, Levin replied with grace, wisdom, and absurdity — just as he did last year when we interviewed him about the artistry of Sharknado. io9: Let's start with the basics. We've got another sharknado hitting the United States in this movie. What are the odds of this happening twice? Thunder Levin: As the Earth warms, the odds of a sharknado occurring in any particular place will continue to grow, eventually reaching a worldwide certainty. Besides, if LA could have one, you know New York is going to do it bigger and better! Have the sharknados changed or evolved since the first movie? Well, they're in New York now, so they're bound to be tougher. Also, why is the chainsaw still the ultimate weapon against sharknado sharks? Because using a flame throwing just results in angry flaming sharks. How is the Sharknado phenomenon connected to climate change? A warmer climate provides more energy for storm formation and leads to more extreme weather, including tornadoes. Melting ice caps change the temperature and salinity of the oceans, altering major currents like the gulf stream. This drives sharks out of their normal habitats and makes them more vulnerable when storms come along and more likely to be sucked up by water spouts. C'mon, this is just basic science. Did you do any research to figure out what shark species you'd like to feature in both movies? Do tornado sharks also have tornado remoras (shark parasites)? Sharknado really forces us to think differently about the process of shark evolution. Now that we live in an era of the Sharknado, will aerodynamics be a new evolutionary factor for sharks, leading to a new apex predator? Sharks are already remarkably aerodynamic. It's not so much that the sharks will need to adapt, as it is that the birds are in trouble! Where do megalodon and sharktopus fit into all this? Would you rather fight 100 shark-sized tornados, or one tornado-sized shark? As long as I've got Ian Ziering with a chainsaw by my side, I'm not too worried about either! Okay, I've made a zombie movie and two shark movies and I still don't know what to make of this question. Why do sharks always have to be the bad guys? Why can't the sharknados fight for great justice? Who says they're the bad guys? I think this question just displays your own prejudices. You're going to find that many of the truths we cling to depend greatly on our own point of view. So who's to say the sharks aren't taking honorable vengeance on their only predator? What's next for Sharknado? Will there be a musical? I wanted the second one to be a musical, but I was voted down. 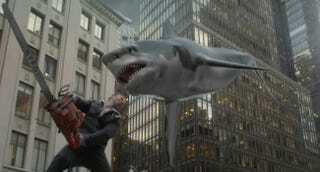 Sharknado 2: The Great White Way. I'd love to see the third one expand beyond the one city dynamic. There haven't been any official conversations yet, but speaking just for myself, I'd love to see a Global Sharkpocalypse next time! And the last question comes from David Shiffman, a marine biologist in Florida, who asks, "Anything to say to a group of marine biologists who will be watching the premiere live in a sports bar that I've reserved?"